Important Communities Preparedness Open House Sept. 22 in Lake Arrowhead! GO!!!!!! Mountain residents…..do you know which emergency preparedness and other important services are available in the San Bernardino Mountain communities? If not, you need to be at the annual Mountain Communities emergency Preparedness Open House and Town Hall Forum that is set for September 22. This important event can provide invaluable help to all mountain area residents. This important event will be held from 6 to 8 p.m. at the Lake Arrowhead Resort and Spa. Even if you attended this important community event last year you need to go again to get updates and new information that could help in an emergency situation. Among the events there will be presentations by the National Weather Service, the U.S. Forest Service and San Bernardino County Public Works. This event is one of those that at least a representative from each family should attend. Learning about how to take care of a family or families during and following a disaster. No one wants to think about what could happen but the reality is that earthquakes, fires and other natural disasters can, and do occur all the time. This annual event will include information that literally has the possibility of saving lives. The first 150 families who attend will receive a free emergency preparedness kit. Come and meet and talk with over 20 exhibitors and meet and talk with emergency responders and volunteers. This is a “learning event” and it is being offered (once again) in our local Rim of the World communities. While it’s not easy to do the time to start preparing for a potential disaster is before it happens. Trying to plan for a disaster after it happens doesn’t do much good. Come! Attend this event! You’ll come away with new ideas to help protect your family, your home and other information that truly can be lifesaving. Remember, what you learned last year may or may not be “up to date” and if you didn’t attend a previous open house you need to attend this upcoming one. Wouldn’t it be fabulous if Mother Nature could send out an e-mail to everyone around the world that a disaster is one the way? We would know when it would happen, where it would happen and how it would happen. We would all know what is coming…but that’s not reality. Don’t be caught. Be as prepared for potential disaster as much as you can be. You’ll sleep better at night knowing that you have, at least, done what you can do to protect yourself, your family and perhaps your property. For more information contact the San Bernardino County Fire Office of Emergency Services at (909) 356-3998. As terrifying as it is to think about the fact is that this is the most serious fire season in decades. While the members and associates of the Rim Fire Safe Council can’t stop a fire from igniting they can give residents as much information as possible so they can help themselves in an emergency. This important community event will be held at the Robert Hootman Senior/Community Center on Running Springs School Road (next to Charles Hoffman Elementary School). Do not miss the Wednesday, July 10 community meeting at 6:30 p.m. to hear how to keep your family and property safe during this dangerous fire season. Agencies that will participate in this forum will include the Running Springs, Arrowbear Lake, CalFire, the U.S. Forest Service and San Bernardino County Fire departments and other partners will share the history of fires in “our” mountains and what they are doing to prepare and the details of the current perilous conditions. After the program be sure and stay to learn how you can do a better job protecting your family, home and property from the wildland fires that threaten our community and most importantly, what to do when wildfires strike “our” area. Call 866-923=-FIRE or visit http://www.MountainRimFSC.org for more information. Watch for future meeting dates in other communities. Wildfires in our mountains……………………it’s not “if” it’s “When.” Are you ready? June 28 the fire use restrictions in the San Bernardino National Forest will rise and residents and visitors need to be aware of the changes. Each year the forest service makes changes, according to weather, time of year and potential issues to the forest and its visitors. This past winter less than average winter snow and rainfall occurred as a result of the second year of drought. unfortunately the seasonal outlook again expects a warmer and drier summer this year with below average summer “monsoonal” rains. This could create the potential for larger fires. Forest officials are taking these steps to prevent human-caused fires and to raise public awareness. Most fires in the San Bernardino National Forest are caused by humans and the increased restrictions are designed to reduce wildland fire. Forest visitors are reminded to exercise caution when visiting the National Forest and they need to maintain a higher level of awareness with the increased fire risk. * Vehicles should always remain on designated roads and never park on dry brush or grass. * Use extreme caution around open flame or heat-producing sources. * Motorists should use their car ashtray instead of tossing cigarettes out the window. Also, be aware that hot brake shoes, hot exhaust system, overheating of vehicles and dragging tow chains can cause fires. Keep tow chains high and off the ground. * Report all suspicious activities to law enforcement. * Wood and charcoal fires are permitted only in developed campgrounds and picnic grounds and within agency provided fire rings or camp stoves. * Wood and charcoal fires are not permitted at Yellow Post campsites, Fisherman’s Camp, Cedar Springs or the following Pacific Crest Trail Camps: Bench Camp, Deer Springs, Doble, Holcomb Crossing, Little Bear Springs and Mission Springs. * Campfire permits are required for propane and gas stoves and lanterns used outside of all developed recreation sites. * Recreational shooting is limited to Public Shooting ranges operated under special use permit only, except those engage din legal hunting. * An approved spark arrester is required for any internal combustion engine operated on designated forest routes. These include chainsaws, generators, motorcycles and off-highway vehicles. * Smoking is limited to an enclosed vehicle or building or within a Developed Recreation site. in the San Bernardino National Forest. The U.S. Forest Service will be aggressively citing those who do not comply with the posted restrictions. Violation of these prohibitions is subject to punishment of a fine of not more than $10,000 or imprisonment for not more than six months or both, as Class B misdemeanors under federal law. People may also be responsible for resource damage, suppression costs and any injuries that occur if they are found liable for causing a wildfire. * Idyllwild Ranger station, 54270 Pine Crest, Idyllwild. (909) 382-2922. * Lytle Creek Ranger Station, 1209 Lytle Creek Road, Lytle Creek. (909) 382-2851. * Mill Creek Visitor Center, 34701 Mill Creek Road, Mentone. (909) 382-2881. * Santa Rosa and San Jacinto Mountains National Monument Visitor Center, 51-500 Hwy. 74, Palm Desert. (760) 862-9984. TO PROTECT THE FOREST WE ALL ENJOY! Have you attended the annual Rotary Art and Wine Festival? If not, you don’t know what you’re missing and you need to take a pen, walk over to your calendar and jot down June 29 from 10 a.m. to 6 p.m. and Sunday, June 30 from 11 a.m. to 4 p.m. All you have to do is show up at the beautiful Tavern Bay Beach Club on the shore of Lake Arrowhead and enjoy, enjoy, enjoy. Each year this popular event just gets better and better and bigger and bigger and all the proceeds go to support Rotary charities. In addition to wine tasting guests stroll (or race, depending on how much time they have) and look at all the booth offerings. It really is quite exciting. Look for ceramics, jewelry, wood carvings, painting with many different mediums, glass items and just about any other “craft” or artwork you can enjoy. Looking for something unique for yourself or a gift? You’re bound to find it at this event because there will over 50 booths. You are welcome to bring your spouse, your children, your grandchildren, the kids down the block but leave “Fido” home because no dogs are allowed. Rotary and the Arrowhead Lake Association members love dogs but they need to stay home for this event. Love to Write? The Mountain Writers organization May Be for YOU! Okay all you writers out there here’s your chance to show your stuff and learn and have great fun while you’re doing it. Did you know there is a Mountain Writers organizations that is primarily for residents of Running Springs, Crestline and Lake Arrowhead? The group meets monthly for fellowship, feedback for works in progress, speakers, self-publishing member’s work, sharing marketing experiences, recommendations for books and/or films, trips to book fairs, conferences and places of interest? If you’ve been yearning to write a best seller or publish something for the pure joy of doing it get involved. Monthly meetings are held in local book stores, restaurants and sometimes in writers’ homes. Joining a group can be very beneficial for writers because they can “bounce” story ideas around, critique each other’s work, provide support and encouragement when members are suffering from “writer’s block” and have fun, all at the same time. For information call (909) 744-8461 for information on the organization and how to participate. If you want, send a message to: mountainwriters@yahoo.com. Wanna’ take a hike? You’re Not Alone! Mtn. 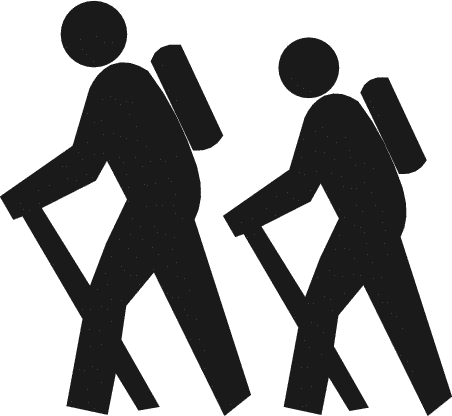 Hiking Club and Sierra Club Want You! 9:00 am, moderate, 8 miles,500 ft. elevation gain. From the Silverwood Park office to Cedar Spring Dam and return. There are beautiful views of the lake from the trail, and possible distant sightings of snow-capped peaks. Bring hiking boots, jacket, lunch and 2 bottles of water. Call hike leader Heather Sargeant 909-336-2836 for meeting place details. 9:00 am, moderate, 5-6 miles. 9:00 am, moderate/strenuous, 10 miles, 1,200 feet elevation gain. 9:00 am, moderate, 4 miles. Green Valley Lake has some of the best snow in our local mountains, so come and join me for a day of fun. No prior snowshoe experience is necessary–it is not difficult to learn–just another form of hiking. You need to provide your own equipment. Meet at the main parking area in Green Valley Lake at 9 am. Wear layered clothing, hat and gloves. Bring hiking poles, boots, snowshoes and a snack and water. Contact hike leader Sandy Ellis 909-867-7115 fsellis67@gmail.com or co-leader, Heather Sargent 909-336-2838. 7:00 am, moderate, 10.3 miles, moderate elevation gain. 8:00 am, easy, 2.5 miles. 8:00 am, moderate, 8 plus miles, moderate elevation gain. There’s six degrees of separation, many degrees between 10 and 650 on your stove, there are “degrees” of right and wrong, there are degrees you receive in high school and college and there are degrees of longitude and latitude.